I decided to try something new and slow cook my ribs. All I can say is that the meat was falling off of the bone. The sweet corn and garlic and butter green beans were the perfect touch to this finger lickin’ good platter. 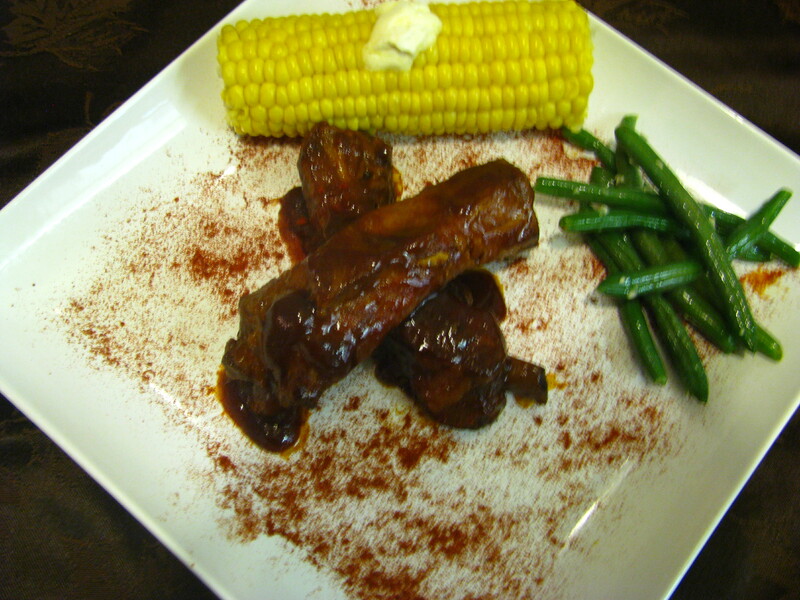 This tastes amazing and it is a lot easier than doing ribs on the grill or in the oven. If you haven’t tried it this way, then I highly recommend it. What is one thing that you have cooked in the slow cooker that is different? What a good idea to cook these in the slow cooker. We use ours for red beans and rice and things like that…love the idea of using it for ribs. I love ribs so much, only way to cook them for me is low and slow on the smoker with a lick of real smoke. How did you slow cook them? I brasied them first then I put them in the slow cooker for about 6hrs with some Homemade BBQ sauce AMAZING!! The ribs look super! I love my slow cooker. I think my favorite thing to date though was the pork for Cuban Pork Sandwiches.